Summer is now almost upon us. And we hope the weather Gods won’t play such a cruel trick on us outdoor enthusiasts as they did last year – so finger crossed for day after day of warm, bright sunshine in which to enjoy your many motorhome holidays. So, how are you going to fill your days as you enjoy all that Great Britain has to offer you while catching a few rays? Well, may we suggest a good old trip to the seaside? Here are three suggestions to help you plan your next trip and enjoy sea air, relaxing beach walks, fresh fish and chips and the sound of children’s laughter while they play in the sand. The area boasts an award-winning Blue Flag beach, a host of leisure activities and a packed programme of family entertainment. The town also offers an array of interesting shops and beautiful floral displays. The more energetic can hire a canoe or pedalo while those wanting something more traditional can watch the antics of seaside classics, Punch and Judy. While you’re there: Visit Swanage Railway, a premier standard gauge preserved steam railway that operates on the six miles of track between Swanage and Norden, through the beautiful Isle of Purbeck, passing the magnificent ruins of Corfe Castle. Ok, quick quiz. Who described Sidmouth as “a feast of visual delight”? 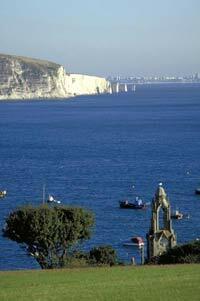 The answer is Poet Laureate John Betjeman who was clearly enchanted by the place, as you will be too. The idyllic seaside resort is tucked between impressive red cliffs and the hills of Sid Valley and offers stunning beaches and a seafront with parks, traditional shops, gardens and restaurants. While you’re there: Visit The Donkey Sanctuary, a UK-based charity working worldwide to improve conditions for donkeys and mules. Since 1969, the sanctuary has taken more than 12,000 donkeys into its care. We’re reliably informed that the donkeys love a bit of fuss! With its quaint harbour and long sandy beaches, Wells-next-the-Sea, designated an Area of Outstanding Natural Beauty, is a popular attraction for bird watchers, a pastime enjoyed by many outdoor enthusiasts. You can also take a boat trip to see watch the colony of common and grey seals. Plus, there’s a host of events, exhibitions, fetes and galleries held throughout the year for you to enjoy – not to mention a number of quaint pubs and restaurants. 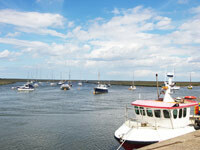 For more information on Wells and the surrounding area, visit www.wellsnorfolk.com. While you’re there: Visit Whin Hill Cider, Wells-next-the-Sea. Based in the middle of the town’s main car park, this is a small company producing cider, perry and apple juice by traditional methods. Its shop and ciderworks are where you can buy its produce or enjoy a glass or two in the courtyard. Wherever you choose to go, we sincerely hope you have a fabulous trip.